My family's connection with Manly started back in the 1920s when Dad’s father, Francis James, founded James Bros. Butchers in Belgrave Street. My parents (Bill and Robin James) helped shape my sense of community. Dad raised money for local charities as a member of Manly Lions Club and through Manly Golf Club. Mum served on the Manly Hospital Auxiliary, volunteered for Meals on Wheels for 40 years and established the first Toastmaster’s Club (ITC) in the area. It may be a local joke, but I was born in Manly Hospital. Many happy childhood days were spent going to the beach at Little Manly, Fairlight and Manly Pool; swimming in Queenscliff lagoon and Manly Dam, playing on the rocket in Tania Park and bush walking to the fisherman’s huts at Dobroyd. I went to Harbord school and then Balgowlah Heights Primary whilst attending Sunday School at Manly Congregational Church. Ballet lessons were at Miss Meldrum’s Ballet Academy in Gilbert Road, tennis at the Bareena Tennis Courts and I got my bronze medallion (just!) at the Manly Baths (before the ‘big storm’ washed it away). Professionally my career has evolved around community engagement and I am a Fellow of both the Public Relations and Marketing Institutes of Australia, and an Associate Fellow of the Australian Institute of Management. I ran my own Public Relations Agency for 30 years working with major corporates, not-for-profits and government agencies. My husband, Jeremy Bingham, was Lord Mayor of Sydney from 1989 – 91, and I was Lady Mayoress. Jeremy specialised in local government, development and town planning matters. Living in Manly and serving as a Councillor on Manly Council for four years, chairing the Little Manly Community Precinct for two years, serving on the Council's Traffic Committee and becoming a Coastal Ambassador has enhanced my passion for wanting to contribute to the protection and enhancement of this amazing area we are privileged to live in. As a Councillor I served on a number of Manly Council's committees including Public Domains, Audit & Risk, Art & Culture, Harbour Foreshore, Heritage & Local History, Human Services & Social Planning, Waste, Community Safety and the Place Management Committee. I was excited to be elected the the newly formed Northern Beaches Council in September 2017 for a three year term. Please feel free to contact me if I can be of assistance to you. 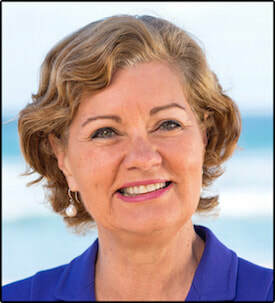 Candy Bingham was first elected as a Good For Manly independent to Manly Council on 8th September 2012 until May 2016 when the Council was amalgamated into the Northern Beaches Council and an Administrator appointed. She was re-elected to the new Northern Beaches Council in September 2017 for a three year term and is currently Deputy Mayor.